Widen KY 18 (Burlington Pike) from two to four or five lanes from Springfield Boulevard to KY 338 (Jefferson Street) to improve safety and capacity for truck and vehicular traffic. Provide multi-use paths along one or both sides of the roadway to improve multi-modal safety. Improvements to this section of roadway will prevent future crashes resulting from geometric deficiencies. The project will improve capacity for along this section of roadway. Installation of bicycle and pedestrian facilities along this section of roadway will provide a direct connection from the existing and future residential development to the pedestrian network in downtown Burlington. 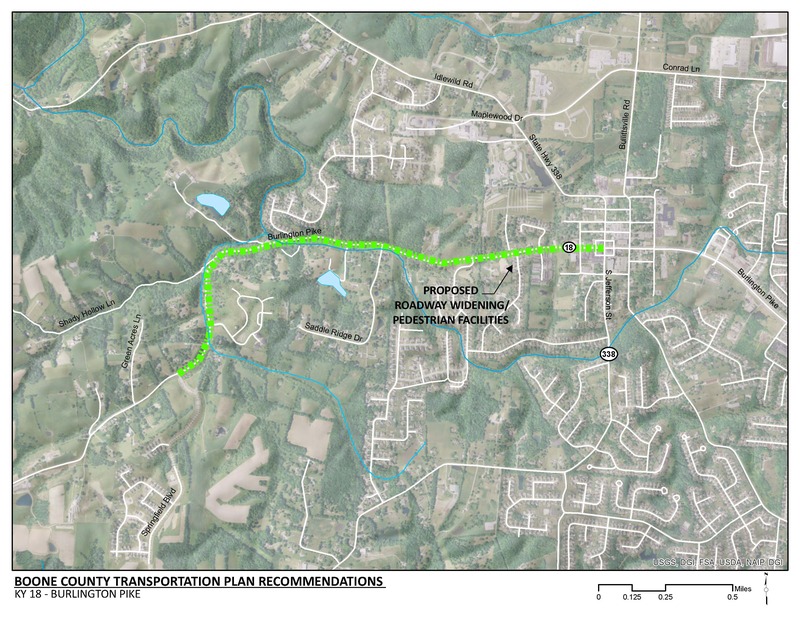 The proposed multi-use paths align with Boone County’s overall goal of improved bicycle and pedestrian safety and connectivity. Click HERE for a map of multi-use paths in Boone County. The eastern project limit is in historic downtown Burlington. There is a National Register of Historic Places property located in the north-east quadrant of the KY 18 intersection with KY 338. The proposed roadway improvements will require crossing Allen Fork. Existing KY 18 (Burlington Pike) is a two-lane facility that connects western Boone County to Burlington, I-71/75 and other arterials in the County. KY 18 is a primary truck route for industries and farms in western Boone County. Expanded residential land use is expected along KY 18 which will increase the traffic volumes along the corridor. Currently KY 18 serves rural, residential and commercial land uses. It also is a primary route for trucks from industries in western Boone County. The eastern project limit is located in historic downtown Burlington. By year 2040, population in the project area is expected to grow by approximately 3,500 households. There are existing geometric deficiencies along the route which consist of narrow shoulders, sharp curves and narrow lanes which can be dangerous for trucks, vehicles, and bicycles. The existing crash rate along the roadway is less than the statewide average. However, there was a fatality along this section of roadway within the five-year period from 2012 through 2016. This head-on crash occurred in a curve, which suggests that geometric deficiencies consisting of sharp curves, narrow shoulders narrow lanes, and superelevation were a likely contributing factor. On the eastern end of the project limits, there is an 850-foot segment with sidewalks along both sides of KY 18. The existing and proposed sidewalks connect to a network of dedicated pedestrian facilities throughout downtown Burlington and along KY 18.